Most of the time finding the origin of an image on Twitter is easy. Just follow the links. For instance, take the chart in this tweet from Twitter user @NinjaEconomics. Should you evaluate it it by figuring out who @NinjaEconomics is? Nope. Just follow that link to the source. It’s usually the last part of a tweet. If you do follow that link, the chart is there, with a bunch more information about the data behind it and how it was produced. 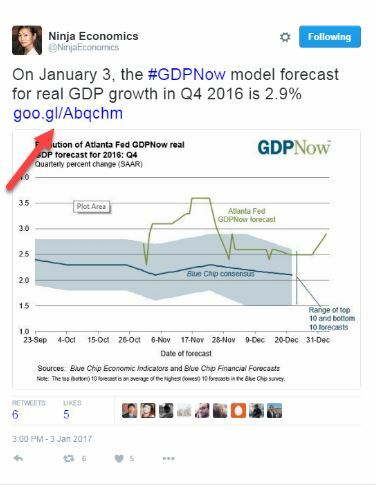 It’s from the Atlanta Federal Reserve, and it’s the Fed — not @NinjaEconomics — that you want to evaluate. 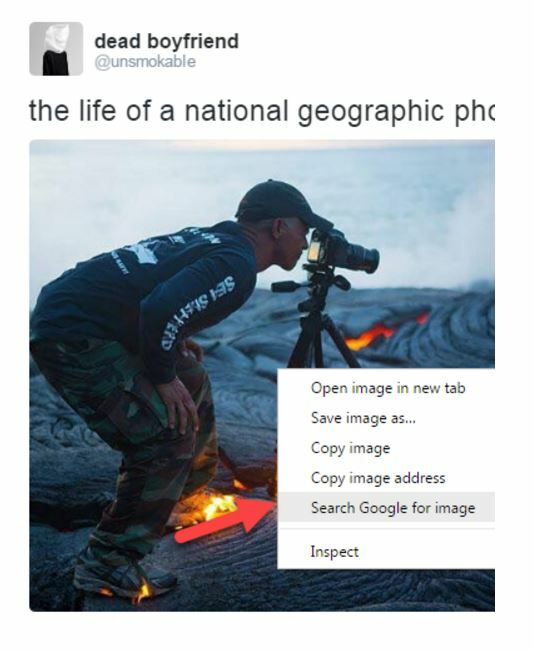 First, is this actually a National Geographic photographer? More importantly, is this real? 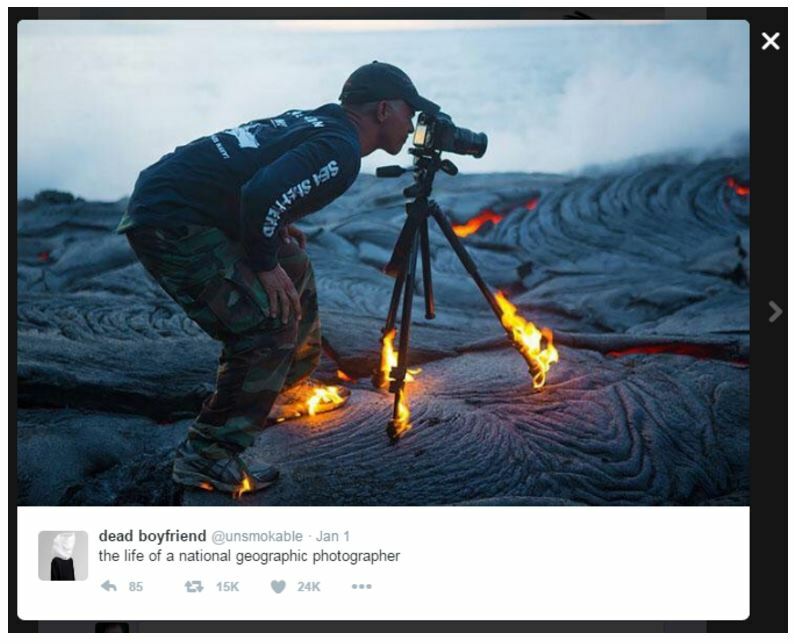 Is that lava so hot that it will literally set a metal tripod on fire? That seems weird, but we’re not lava experts. 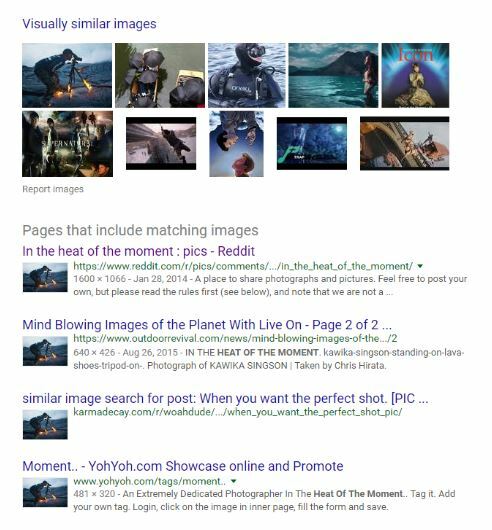 When we reverse search this image we find a bunch of pages that contain the photo, from a variety of sites. One of the sites returned is Reddit. 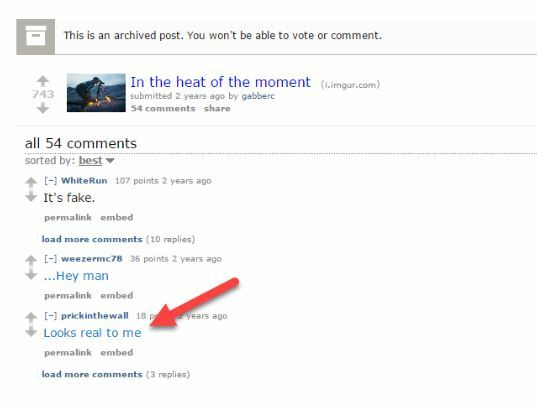 Reddit is a site that is famous for sharing these sorts of photos, but it also has a reputation for having a user base that is very good at spotting fake photos. So did his shoes catch on fire, or did he set them on fire? I do notice at the bottom of this page though that this is just a retelling of an article published elsewhere — it’s not this publication who talked to the photographer! It’s a similar situation to what we saw in an earlier chapter, where The Blaze was simply retelling a story that was investigated by The Daily Dot. So a local news outfit has confirmed the photographer did use an accelerant. The photograph was staged. Are we done now? Not quite. You know what the next step is, right? 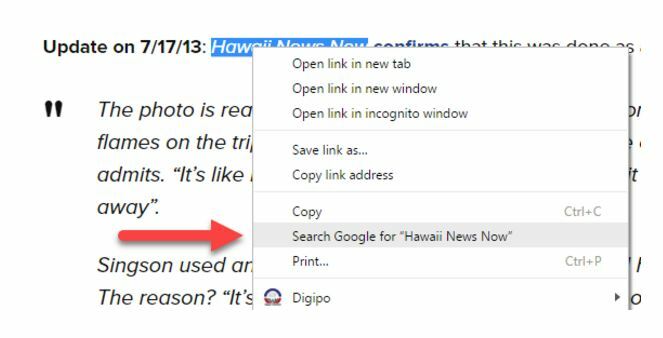 Go upstream to Hawaii News Now! 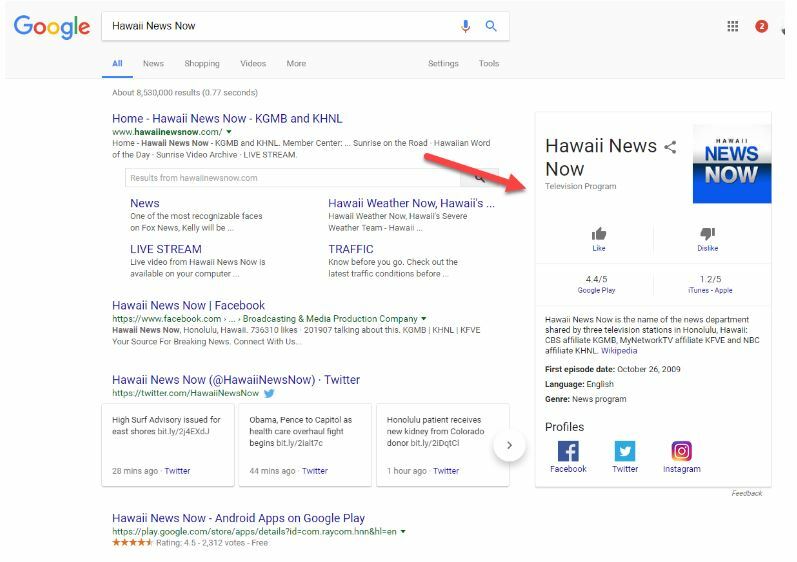 And what we get back is pretty promising: there’s a Google Card that comes up that tells us it’s bona fide local news program from a CBS affiliate in Hawaii. And honestly, you could stop there. We’ve solved this riddle. 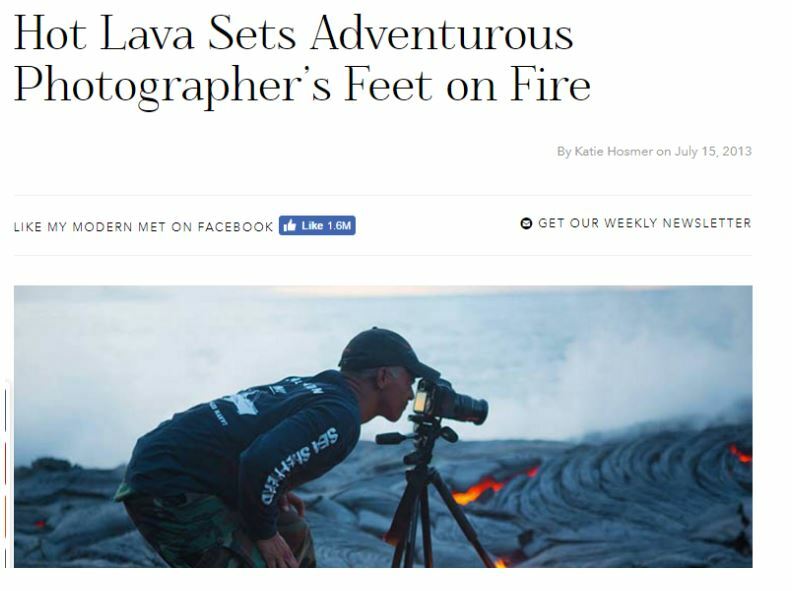 The photographer was really on hot lava, which is impressive in itself, but used some accelerant (such as lighter fluid) to set his shoes and tripod on fire. Additionally, the photo was a stunt, and not part of any naturally occurring National Geographic shoot. We’ve traced the story back to its source, found the answer, and got confirmation on the authoritative nature of the source. We’re sticklers for making absolutely sure of this, so we’re going to go upstream one more time, and click on the Wikipedia link to the article on the Google card to make sure we aren’t missing anything, but we don’t have to make you watch that. We’ll tell you right now it will turn out fine. In this case at least. Using Google Reverse Image Search Copyright © 2017 by Michael A Caulfield. All Rights Reserved.